Anyone who has struggled to understand speaker announcements at train stations will be heartened by work initially done at Warwick University in the UK. Engineers claim their new ultra-thin speakers, as well as looking good and being easy to conceal, will also deliver clearer, crisper sound. The loudspeakers could replace public address systems in passenger terminals and shopping centres. They could also be used as speaking posters to deliver adverts. The system, dubbed flat, flexible loudspeaker (FFL), started life as a piece of tin foil and some baking paper. 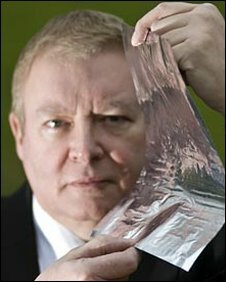 These materials were first used to produce sound by Warwick University professor Dr Duncan Billson. It provided proof of concept and since then the system has developed into a complex set of flexible laminates made up of different conducting and insulating polymers. Traditional speakers work by converting an electric signal into sound. What makes the FFL different from existing speakers is that when stimulated by an electrical signal it moves air as a bulk mass rather than from a point source. This means sound is more evenly distributed around a room without the blasting effect of traditional systems. Steve Couchman, the chief executive of Warwick Audio Technology, the spin-off firm created to sell the speakers, said: "We believe this is a truly innovative technology. Its size and flexibility means it can be used in all sorts of areas where space is at a premium." The speakers could be concealed inside ceiling tiles in the home, printed with a design and hung on the wall like a picture or even wrapped around a lampshade. He said the firm had had interest in the speakers from audio-visual companies for use in digital signage. Car manufacturers are also interested in the speakers because they allow sound to be directed which means, for example, music could be heard in the back of the car but not the front. But the design could make the speakers particularly useful for PA systems, said Mr Couchman. "The sound produced by FFLs can be directed straight at its intended audience. The sound, volume and quality does not deteriorate as it does in conventional speakers which means that public announcements in passenger terminals could be clearer, crisper and easier to hear." The firm hopes to launch its first commercial product later this year.